This film belonged to three women: the superbly nuanced Nicole Kidman who is on a red-hot streak this year, the restrained luminosity of Kirsten Dunst and brilliant writer/director Sofia Coppola who transformed a simple story into this gorgeous, tightly-paced, Southern Gothic/noir-ish and atmospheric film that focused on the characters rather than the more sensational aspects of the story. Coppola's directed this film with a very assured hand. The story moved at a clipped pace and nary a scene was extraneous or longer than necessary. She captured the complexity of the women (Kidman and Dunst) and the innocence of the girls (especially standout actress Oona Laurence), and also the tumultuous paradox of a teenager (brought petulantly to life by Elle Fanning, the other named-actress who had decidedly much less to do than the publicity/marketing would suggest). The film has two distinct acts and the change and evolution of Kidman's and Dunst's characters were fascinating to watch. They were definitely not one-dimensional characters but neither were they written, or portrayed as, stereotypical cliches. They were what Ryan Murphy would wish he could have written for Jessica Lange and his bevy of film stars back in the early days of American Horror Story. Actually, The Beguiled does have its sensibilities within the realm of AHS' reality but the difference is that Coppala effortlessly elevated the material above camp. And it would be fascinating, in this day and age of Peak TV, to envision Coppala and co bringing this to the small screen as a limited event mini-series. Four to five episodes to adequately flash out the characters, and maybe even add more layers to poor Colin Farrell's single white male Macguffin. The lack of coloured characters was simply written off as "the slaves ran away", and I do not think it was as a big a deal as most made it out to be. It was logical. It made sense. Most importantly, it was not part of this contained, almost bottleneck-like, story, and neither would Coppala be the most appropriate director to tell that story. Kidman commanded the screen. Her nuanced performance added layers to her character whom we never really fully understood, but so desperately wanted to find out more. Who is she? Who was she? What is she really thinking? 2017 has really been Kidman's year. First we had Big Little Lies, then her scene-stealing performance in Top of the Lake: China Girl, and next up will be another team-up between her and Farrell in Yorgos Lanthimos' The Killing of a Sacred Deer and between her and John Cameron Mitchell in How To Talk to Girls at Parties. Whether any of these roles will win her any awards will be hard to say, but she is definitely on a streak/resurgence as her Botox wears off. Dunst, like Kidman, is also having a resurgence of sort which can tracked back to her astounding performance in Lars Von Trier's 2011 Melancholia, which was then followed by her breathtaking turn in season two of Noah Hawley's Fargo. Here, Dunst was an epitome of restrained beauty. Despite not having being told much about her character's backstory, Dunst still managed, like Kidman, to imbue her character with so much mystery. And yet, when she breaks out of her usual confinement, it was not surprising, but seemed so entirely true to character. Bravo to Dunst and Coppola. Farrell had much less to do here. But his charming Irish roots definitely helped to sell his character. However, Coppola obviously paid less attention in rounding out his character than her female cast, which is understandable given the limited length of a feature film. And especially in this case, where Coppola chose condensed brevity over indulgent expansiveness. Like aforesaid, Fanning role though pivotal, was actually much less in comparison to Kidman and Dunst. And fellow actress, the standout Laurence (of Southpaw and Matilda fame) definitely had a meatier role than her. Cinematography was by Philippe Le Sourd and was gorgeous. Coppola and Le Sourd chose to film much of the film with as naturalistic a light as possible, and the result was an intimate aesthetic. But yet, it gave the audience, so used to modern day lights and electricity an oddly contrary sense of unfamiliarity. Music was by the french rockers Phoenix (frontman, Thomas Mars, is married to Coppola), and with an excerpt from Monteverdi's Magnificat. The result of which, was like the lighting, something familiar to modern audience yet juxtaposed in a foreign setting. 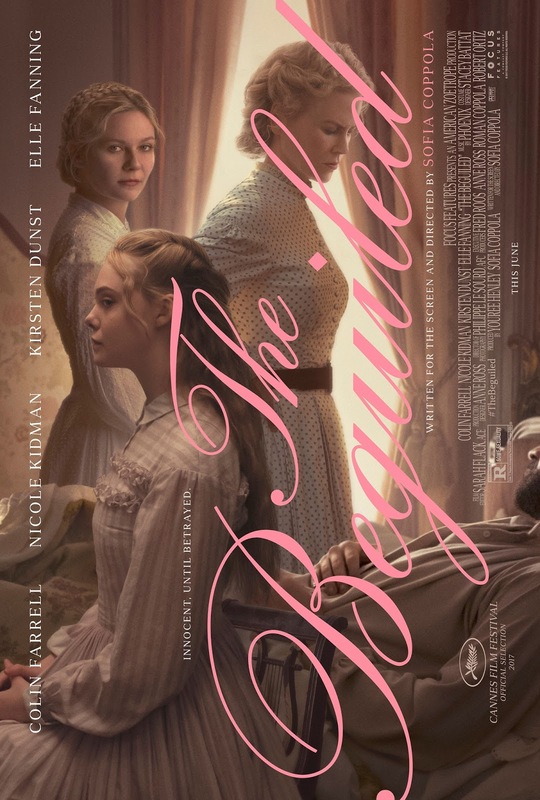 The Beguiled was simply a beautiful film to watch. Yes, it may be superficial in its scope, but in its simplicity and brevity (94 minutes in total), it engages and it challenges, and it very definitely entertains. Let the Oscar season begin!